RIO DE JANEIRO - Stipe Miocic of the United States beat Brazil's Fabricio Werdum in front of his shocked home crowd on Saturday to become the new UFC heavyweight champion. The American fighter used his boxing expertise to knock out the Brazilian in the first round of UFC 198 in Curitiba, Southern Brazil. This wasn't an ordinary championship though. In victory, Miocic wanted the world to know it was about more than just him. Celebrating in front of a sold-out but ultimately disappointed crowd of 45,000 fans at Arena da Baixada, Miocic shouted: "Cleveland, this is for you!" Werdum started on his feet, avoiding Miocic's attempts to bring him to the floor and use his jiu-jitsu. 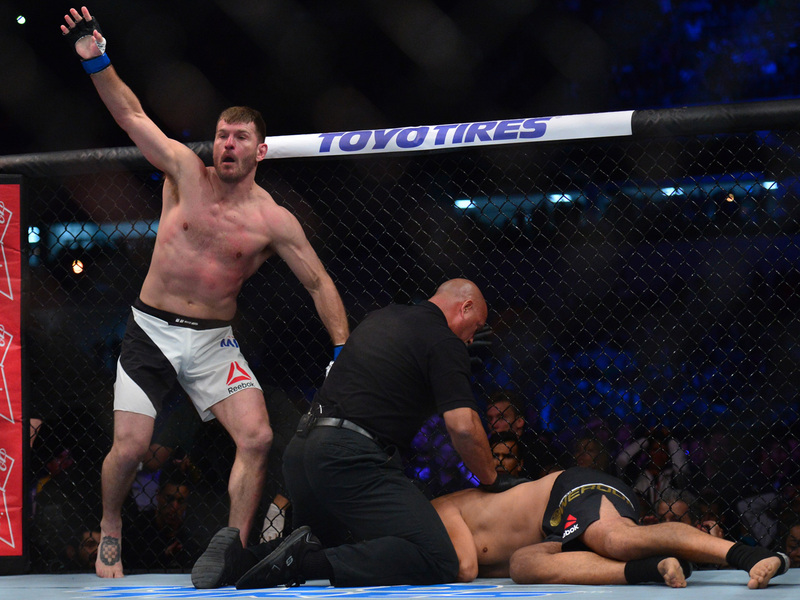 But as he moved toward the American, Miocic landed a sucker punch on the Brazilian's chin to quickly end the contest. Miocic, an Ohio firefighter, won six of his past seven fights. Werdum had won five straight fights, highlighted by a win against Mark Hunt for the interim title and then a submission victory against Cain Velasquez in a unification bout. The bout was scheduled for February until Werdum pulled out with injuries and forced a postponement. Cleveland's long-suffering sports fans have not celebrated a major professional championship in team sports since 1964, but they can at least celebrate Miocic's individual achievement. The city's sports franchises took to social media to welcome the city's first champ in a half-century. "I would like to thank the fans. You were against me, but you made all this happen. Fabricio is tough, I had to guess what he was doing, so I was preparing for this," the new champion said. Still looking surprised at the octagon, Werdum said: "I have to admit that he was better than me. But I will do all I can to come back and be champion again," said the 38-year old Brazilian. The local fans could celebrate a Brazilian victory over an American opponent in the key women's fight on the undercard as Cris "Cyborg" Justino needed just one minute and 20 seconds to knock out Leslie Smith of the United States. The Brazilian veteran now has a 16-fight winning streak since her debut in 2005, stopping ten consecutive opponents and winning titles in the Strikeforce and Invicta promotions. Fans have long clamored for Justino to face former UFC bantamweight champion Ronda Rousey, but Justino was concerned about making the weight. Rousey's loss to Holly Holm derailed the discussion. Justino served a one-year suspension in 2012 for testing positive for steroids. UFC champion Miesha Tate was watching Justino's "impressive performance." ''What a powerful woman! Congrats on making 139lbs! Four more and we can have a title fight!," Tate said on Twitter. In other main card fights, welterweight Bryan Barbarena of the United States beat home crowd favorite Warlley Alves in a unanimous decision. In a split decision, Brazilian light heavyweight Mauricio Rua outpointed American Corey Anderson. Middleweight Ronaldo Souza got a technical knockout against countryman Vitor Belfort.